As a little boy, I showed an abnormal aptitude for mathematics this gift played a horrible part in tussles with quinsy or scarlet fever, when I felt enormous spheres and huge numbers swell relentlessly in my aching brain. In The Character of Physical Law (1965, 2001), 33. I can say, if I like, that social insects behave like the working parts of an immense central nervous system: the termite colony is an enormous brain on millions of legs; the individual termite is a mobile neurone. In Late Night Thoughts on Listening to Mahler's Ninth Symphony(1984), 224. Note: Spelling “neurone&rdwuo; [sic]. I have said that mathematics is the oldest of the sciences; a glance at its more recent history will show that it has the energy of perpetual youth. The output of contributions to the advance of the science during the last century and more has been so enormous that it is difficult to say whether pride in the greatness of achievement in this subject, or despair at his inability to cope with the multiplicity of its detailed developments, should be the dominant feeling of the mathematician. Few people outside of the small circle of mathematical specialists have any idea of the vast growth of mathematical literature. The Royal Society Catalogue contains a list of nearly thirty- nine thousand papers on subjects of Pure Mathematics alone, which have appeared in seven hundred serials during the nineteenth century. This represents only a portion of the total output, the very large number of treatises, dissertations, and monographs published during the century being omitted. In Presidential Address British Association for the Advancement of Science, Sheffield, Section A, Nature (1 Sep 1910), 84, 285. Train yourselves. Don’t wait to be fed knowledge out of a book. Get out and seek it. Make explorations. Do your own research work. Train your hands and your mind. Become curious. 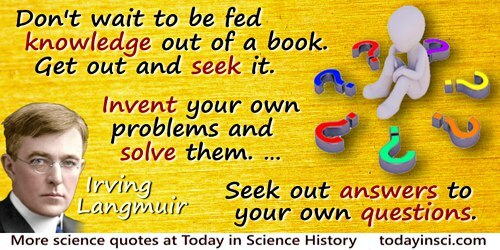 Invent your own problems and solve them. You can see things going on all about you. Inquire into them. Seek out answers to your own questions. There are many phenomena going on in nature the explanation of which cannot be found in books. Find out why these phenomena take place. Information a boy gets by himself is enormously more valuable than that which is taught to him in school. In 'Dr. Irving Langmuir', Boys' Life (Jul 1941), 12.